The layout for Stepping Stones was designed by Judy and Bradley Niemeyer. Stepping Stones was designed to teach a simple concept using two strips of fabric to create one very simple and appealing block design. 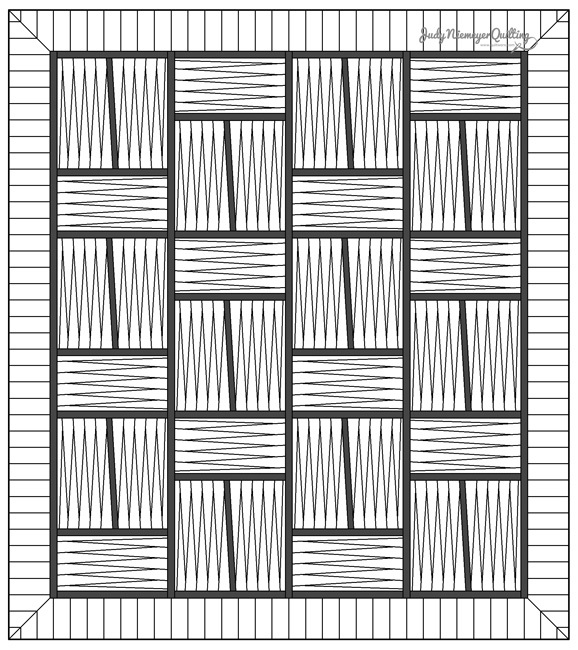 This pattern includes, easy cutting instructions using 2-1/2″ by 42″ strips, and foundation paper. 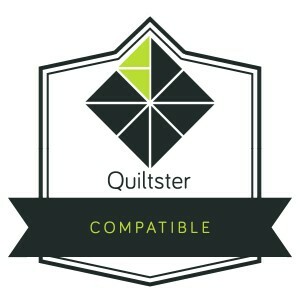 This quilt was designed for all skill levels making this a fun and easy quilt for any beginner or advanced quilter to make up in just a few days. 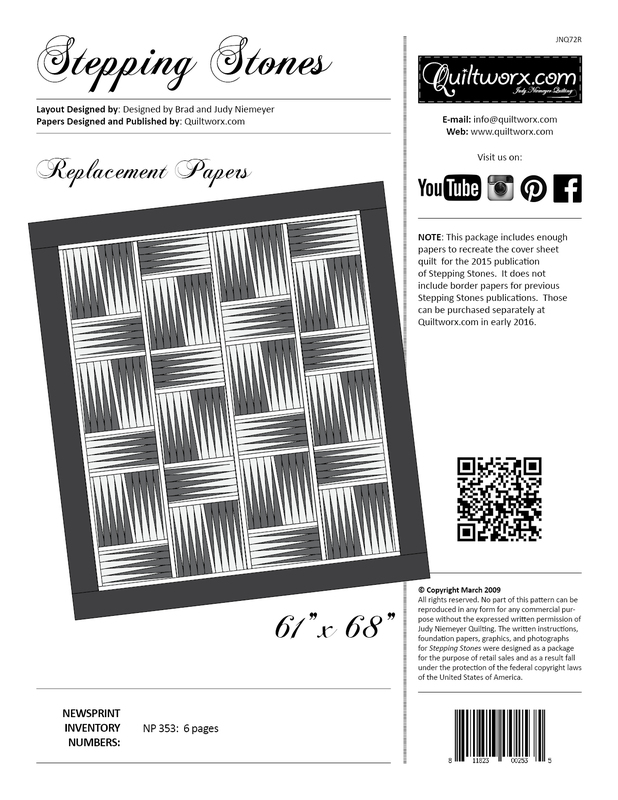 The pattern was republished in November of 2015 to include a new coversheet and instructions to match a revised color layout of the pattern. This version was made using a limited release strip set called the Willow Strip Set designed by Judy and Judel Niemeyer, with Timeless Treasures. The Strips are Tonga Batiks, all with the same print, but in 20 different colors, with 2 of each strip included the package. 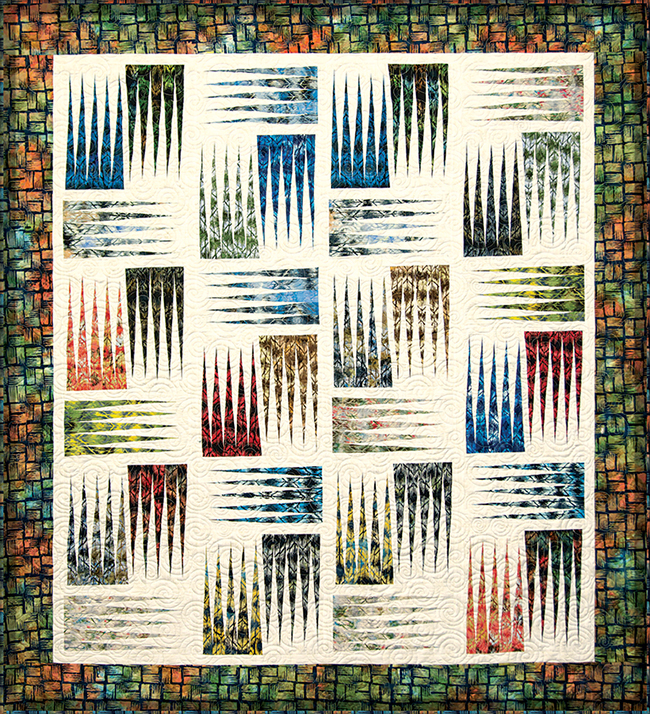 The border print used in the coversheet was designed using the Stepping Stones block, itself, adding a unique opportunity to use fabrics in your quilt that are the same design as the quilt pattern itself! 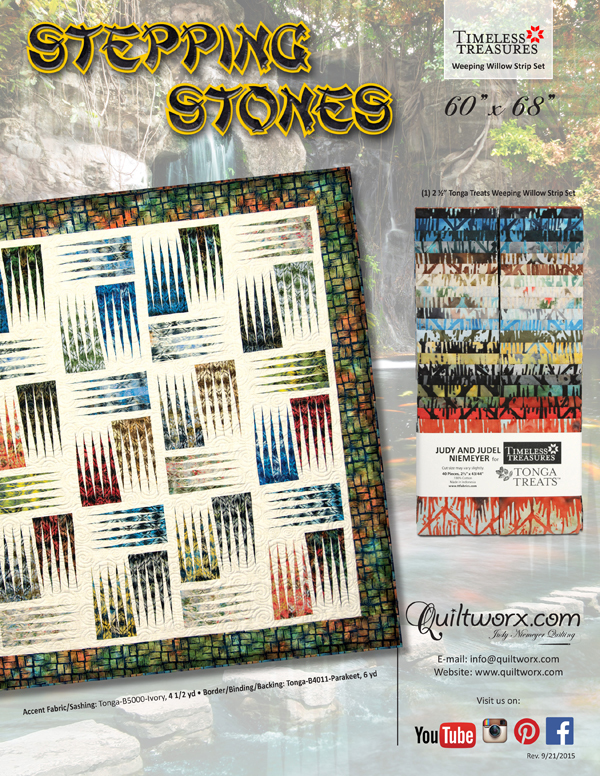 To find the strip sets, please contact your local quilt shop. 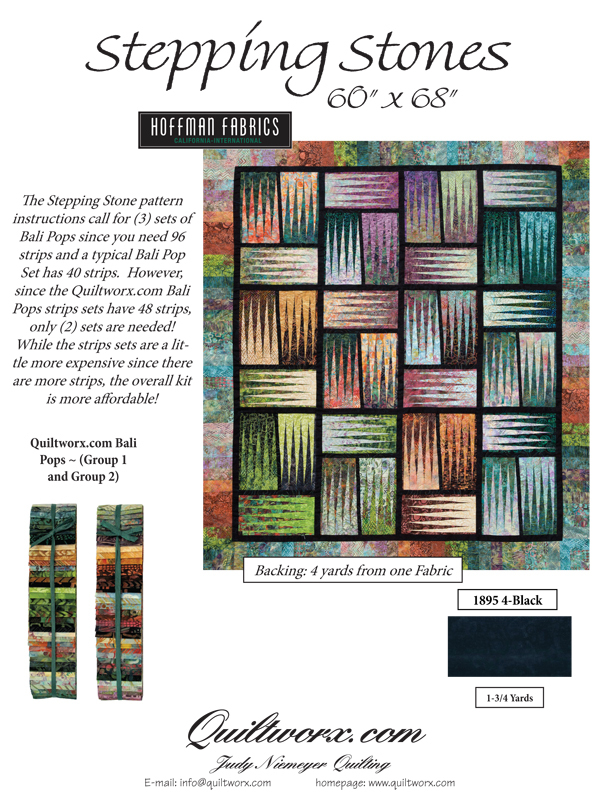 For more information on fabrics used in the pattern, reference the kitting handout below, or visit the Timeless Treasures Website, by clicking here: Willow Strip Set and Coordinating Fabrics and Stepping Stones. Judith Gilbert Made this one a few years ago, love it. Jo Anne Fowlkes Still Gorgeous! Penny Squibb Vicki Birnie looks amazing. Sandra Coleman Is this a kit? Joyce Short Beautiful! Love the colors!! Deb McGuire Ooh, nice colors, Jeanette! Theresa Lang Jeanette Walton what fabric line did you use! Robin Bailey Wow, you have been busy. Leila Rice Got the pattern, now just waiting for the courage to start it. Kathryn Perry Pulliam Love the great job. 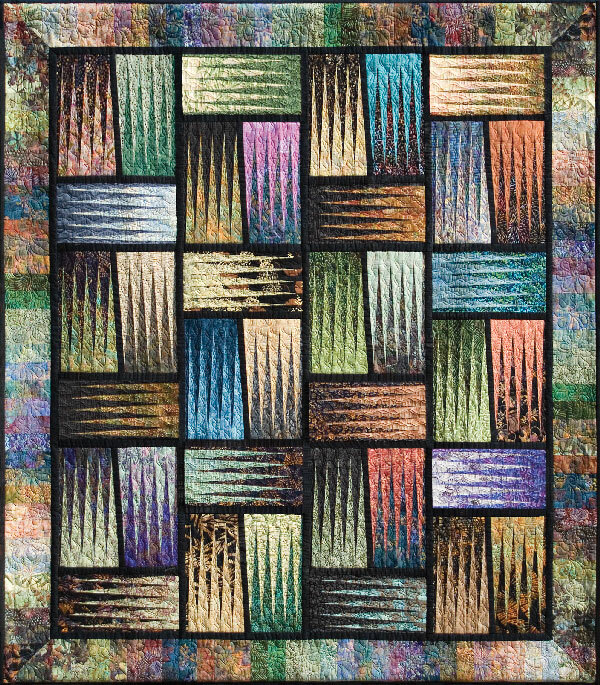 Donna Maheux Hayes I love this quilt, the colours are awesome!!!! Honnor Yaxley lovely. Must have taken you hours of concentration. Jean Edmunds What a unique quilt - love everything about it!